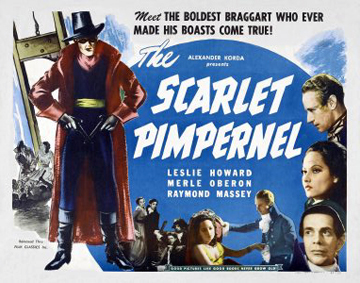 London fop Percy Blakeney (Leslie Howard) is also secretly the Scarlet Pimpernel who, in a variety of disguises, makes repeated daring trips to France to save aristocrats from Madame Guillotine. His unknowing wife (Merle Oberon) is also French, and she finds that her brother (Walter Rilla) has been arrested by the Republic to try and get her to find out who “that damned elusive Pimpernel” really is. 06 Mar	This entry was published on March 6, 2016 at 8:41 am. It’s filed under Public Domain Movies, Video and tagged European Union, France, French language, French people, French Revolution, London, Louis XVI of France, Marie Antoinette, PARIS, United Kingdom. Bookmark the permalink. Follow any comments here with the RSS feed for this post.